You are the first to know! 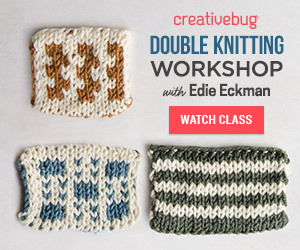 I have a new creativebug knitting class coming out this month. The first lesson is scheduled to come out on February 8th. With the introduction of this class I will have NINE classes on creativebug’s platform. I love working with their team and truly believe you will enjoy the format of their classes. This class is an Entraloc workshop. It will be run as a three part series. Every Wednesday over three weeks will release a new part of the class. Throughout the workshop you will be able to make three different projects. During the three weeks you will learn how to knit entraloc flat in a shawl, and in the round for a cowl and a hat. We will talk about how to decrease and increase with this technique as well. Although the class doesn’t launch until February 8th you can sign up now to make sure you don’t miss it. If you sign up today you will get a two week free trial. If you go to my class page you can click ‘start free trial’ in the top right corner. You can try out the first two weeks of the class and even try my other classes with creativebug. If you love the classes you can sign up for the monthly membership on creativebug’s site, they have new classes added often.